Have you ever seen a pure black crow flying in the southern summer sky? I haven’t either. But with a little imagination, I can see Corvus the Crow in the night sky. This constellation is simple to find, and very obvious. 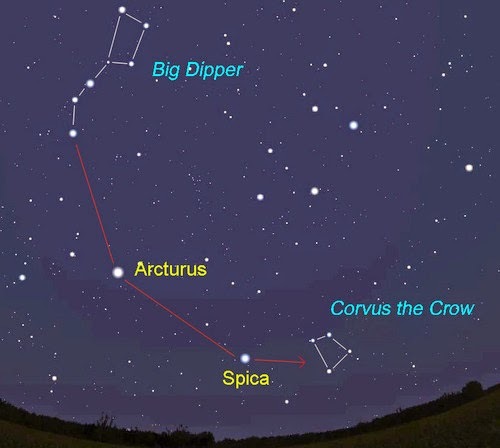 The sure fire way to find Corvus is to look to the Big Dipper as an anchor point. Follow the handles arc back to one of the brightest stars in the sky, Arcturus. Continue the arc to Spica, and on to Corvus as seen below. 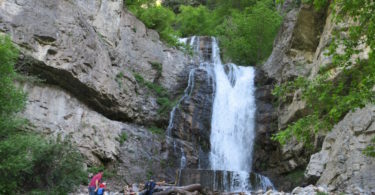 This is facing pretty much south on June 1. Astrobob created this picture using my favorite program, Stellarium. Corvus can only be seen in the southern sky during the summer months. It rises in the southeast and sets in the southwest in June. The story of the crow involves Apollo. In the story, Apollo punishes the crow for lying by placing him in the sky and turning him black. He is placed close to the Hydra and the cup (Crater). 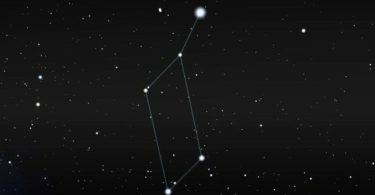 Be sure to check out our other sky information on the constellations tab. Stargazing for Beginners will help you find many more constellations!